With the economy struggling and job prospects dimming, Makerere’s fresh graduates must prepare for trying times ahead. 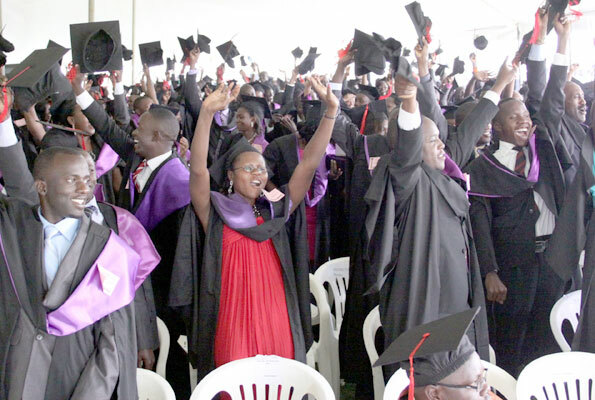 As the first batch of 11,022 students graduated at Makerere University yesterday, the hostile economic environment that offers no immediate prospects for jobs was upper most in the minds of many. Save for years when the country was facing civil conflicts, not many graduates have emerged from the awards ceremony to a stressed economy where jobs are as depressed as this year. International pressures that saw the global economy shrink starting from 2008 and domestic factors have conspired to create possibly the worst conditions for fresh job seekers trying to enter the market. With down-town traders on strike and those who graduated before them but unable to find jobs, graduates wondered what the world out there holds for them. “Most of us don’t have rich parents to take us to their offices to work as their assistants so we don’t know when we will land our first jobs but we will keep trying hard because we know that it is better trying than never,” said Zaidi Tebazaalwa, who graduated with a Bachelor of Science in Zoology. He hopes to work at least as a research assistant for his first job. And these fears are not misplaced. The Africa Development Indicators report released by the World Bank placed youth unemployment in Uganda at 83 per cent. Youth here being people between 15 and 24 years. Presiding over the graduation of about 3,000 students on Day One of the week-long event that will see a total of 11,000 students graduate, Makerere University Chancellor, Prof. Mondo Kagonyera, asked President Museveni to “provide a special desk to help keep on the lookout for and coordinate the funding of students’ innovations. “Innovation is an essential component of any nation’s long-term growth strategy and any funding devoted towards helping turn these creative ideas into successful, economically-viable projects will greatly ease the current strife faced by our graduates who search for jobs for years on end,” said Prof. Kagonyera. There are no accurate unemployment figures in Uganda but estimates indicate that only a fraction of graduates with some form of qualification get absorbed in the limited formal job market. At least 400,000 graduate each year but projects registered by the Uganda Investment Authority indicate a potential to create only 150,000 jobs annually, leaving an estimated 350,000 on the street. In the recent past, different colleges at the 89-year old institution have come up with different projects that look forward to solving basic problems in day-to-day life. These included the electric automobile - Kiira EV - developed under the Presidential Initiative Project and Standardised Ethics and Integrity Scale that seeks to identify corrupt officials. However, many of such projects are still stagnant due to limited funding. Meanwhile, Daily Monitor has learnt that Makerere University will award Kenyan President Mwai Kibaki an Honorary Doctor of Laws on January 24, at a function to be attended by his Ugandan counterpart, Yoweri Museveni, who received a similar honour in December 2010. The University Council resolved to “honour H.E President Mwai Kibaki in recognition of his distinguished and outstanding contribution to public service at the national, regional and international levels”. Kenya’s Kibaki will not be the only high-profile guest as former South African president Thabo Mbeki is also expected to pay a visit to the university during the graduation week. Hosted by Vice Chancellor Prof. Venansius Baryamureeba and chaired by Prof. Mahmood Mamdani, the director of Makerere Institute of Social Research, Mr Mbeki will conduct a public question and answer session in the Main Hall under the theme “Africa and the World: Intervention and Reform”. The first 10 questions will be asked by key figures in the academia and the media and then the general audience will also be given chance to ask.